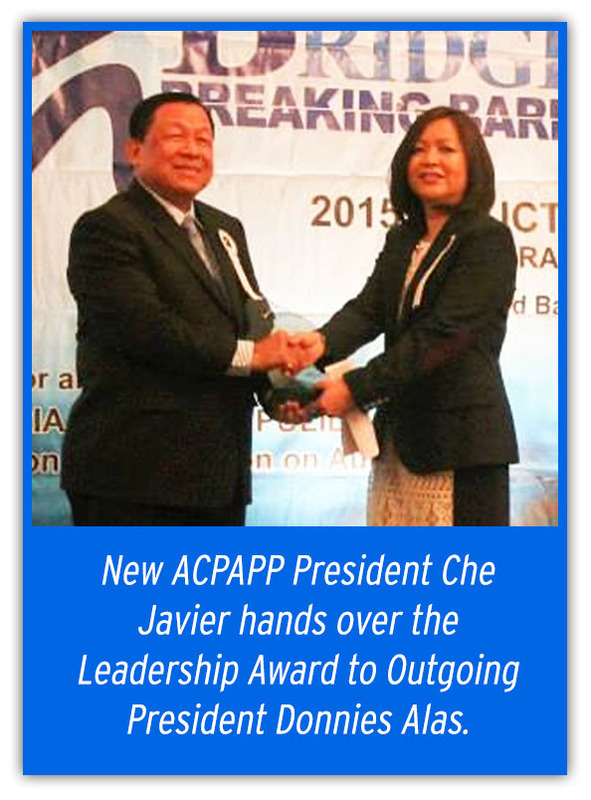 Mr. Donnies Alas, ACPAPP Outgoing President, was presented with Leadership Award during the 2015 ACPAPP Induction Ceremonies last January 27, 2015 at Intercontinental Hotel, Makati City. New ACPAPP President Cherrilyn Javier presented the award along with Secretary Efren Bautista and Foundation Secretary Peps Zabat. During his term as President, he was credited for his incessant effort to reach out to all ACPAPP members making sure that their professional development needs are addressed. “In ACPAPP, our business is not proﬁt. Our business is to serve others. Our reward is not money, but the happiness and satisfaction of seeing our member practitioners competent and well-trained - who will and can render quality service” said Mr. Alas in his valedictory address. “Thank you for entrusting me with the honour and privilege of serving as your President. It is now my pleasant duty to pass on the baton of leadership of this prestigious organization to our incoming President Cherrilyn M. Javier.” a concluding message of Mr. Alas. The primary goal of Association of Certiﬁed Public Accountant in Public Practice known as ACPAPP, is to have competent Filipino CPAs in public practice who are committed to provide, with integrity, services that meet the expectations of clients and stakeholders.